My review of Mary Ann Tharaldsen Doomsday art work, looms large as Pope Francis predicts another world war. What is it we are returning to? What keeps going wrong with the world that dooms us to repeat a horrific history over and over again? For years I have been looking at my kindred’s involvement in the terrible Fourth Crusade where the Franks looted and destroyed Constantinople which allowed Islam to defeat the Crusaders and make inroads in the West. The Shroud of Turin was part of that loot. I believe it cursed the family that came to own it. I have often bid my reader to…………..Repent! Who will die for our sins? 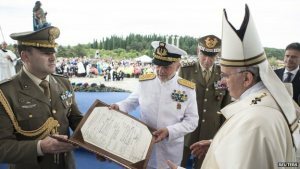 Pope Francis this morning warned that, after a century marked by two World Wars, the world may be in the grips of a third one being “fought piecemeal, with crimes, massacres, destruction”.